Prashant said his father didn’t go after any celebrity status as he didn’t want the authenticity of Iyengar yoga to be compromised. Iyengar Yoga is designed in a way which can be practiced with precision and alignment in all postures by anyone, said Prashant Iyengar, son of BKS Iyengar, in an event held ahead of his father’s centenary celebrations. Prashant added that similar yoga sessions were conducted in the third-world countries too where concession on fees was provided to the students, which attracted a lot of crowd. Abhijata Iyengar, grand-daughter of BKS Iyengar, said the Iyengar yoga uses multiple props that can help even a bed-ridden person to perform yoga with gradual precision. “As we have simplified yoga with the help of these props and simple methods, Iyengar yoga has been acclaimed internationally and will continue to do so in the future too. We don’t believe in copyrighting Iyengar yoga because it belongs to everyone and we can’t compromise with its spiritual and physical values,” she added. A senior student of BKS Iyengar Institute said over the last year, multiple yoga sessions have been conducted in the major cities of India to spread awareness. 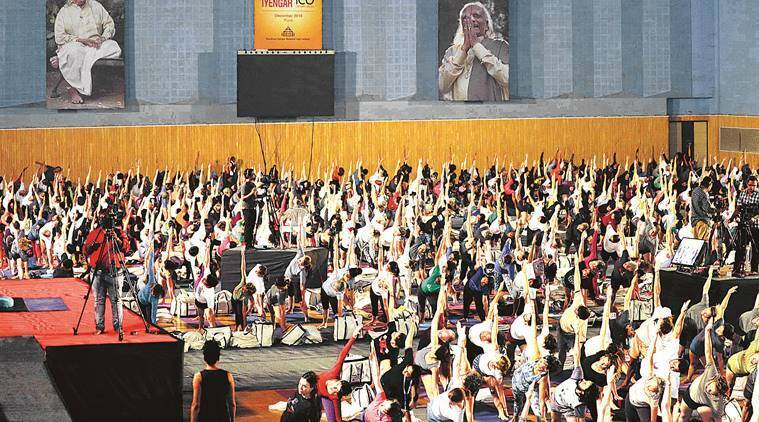 These multiple sessions held across the country will culminate into a yoga exposition at the Balewadi Sports ground in Pune till December 14.